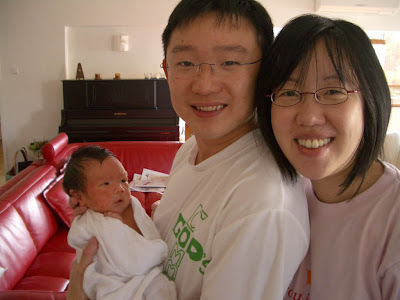 This Chinese New Year we visited Wilson & Shih-Huei and their newborn baby, Ezra. Wilson & Shih-Huei are friends from our days in Trinity Theological College who knew us before we got married. Ethan seemed delighted to meet his new friend because when Daddy lifted him near the cot to see Ezra, he started laughing so heartily that we had to carry him out of the room so that he wouldn't wake Ezra up! Ethan's got a really infectious laughter! That has got to be the lethal combi of Ivan and Re! Kudos! Will visit you guys soon.